Is your Christmas Tree up? How about your Hanukkah Menorah or your Kwanzaa candles? Are you ready for the holidays? Shopping done? 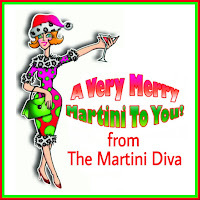 You may think you're ready but you're not until you've got your cocktail cheer on! Here's EVERY. SINGLE. HOLIDAY. COCKTAIL. I've ever concocted and enjoyed as I waited for Santa's bounty to drop down my chimney. Don't bother counting, there's over 50 seasonal drinks here at last count and each year it grows. With this comprehensive database of holiday drinks and liquor recipes, you can spread the holiday cheer as well. 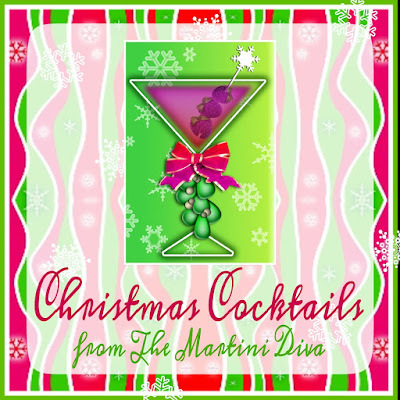 In fact there's enough for you to try out a different cocktail twice a day for the whole month of December. 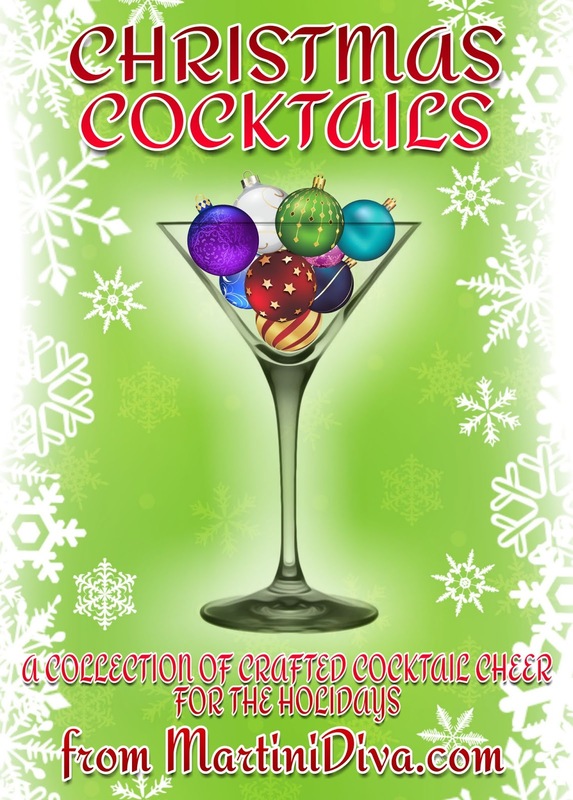 I'm sure I'll add more, I always have to do one or two new cocktails of cheer each year so bookmark and save this page. 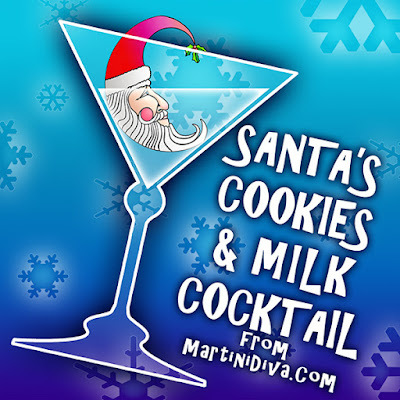 On Christmas Eve instead of putting out a plate of cookies and milk why don't you shake up this cocktail and give Santa some real Christmas cheer? I'll bet it will improve the quantity and quality of the presents under your tree and in your stockings come Christmas morning! Nothing says "gimme better swag" than a nice cocktail waiting at the bottom of that chimney! GLASS: Cocktail (martini) or coupe. Dip the rim of your glass in some of the Irish Cream and then into the crushed Oreos then chill glass in the freezer while you mix your drink. Fill a cocktail shaker with ice then add the coffee liqueur, vodka and cream and shake until chilled. Pour into your glass then slide a full Oreo cookie on the rim as a garnish. P.S. I get 10% of your haul if this works. 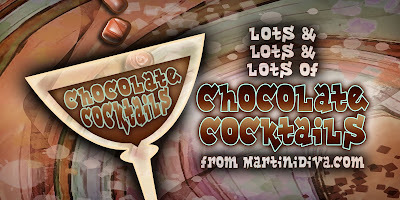 CHOCOLATE COCKTAIL RECIPES - LOTS of Them! 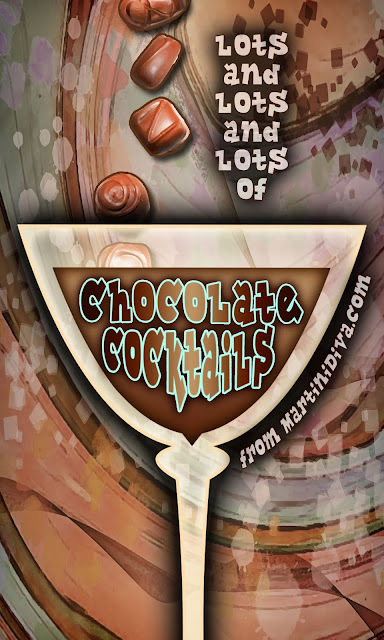 I have been posting cocktail recipes for over ten years and I am a huge chocoholic, so it's no wonder I have so many chocolate inspired cocktails. But even I was not aware of how many until I lined them all up in one place. If you can put chocolate in it, on it or around it I've found a way to add booze to it. I still don't know how many I have, even with them listed here, there's so many I lose count! And I didn't even include my chocolate coffee recipes, you can find those over at my Coffee Cocktails. I also didn't include the ones I did for The Beatles Anniversary, Star Wars or Star Trek. And don't be surprised if I add more here, chocolate is my favorite everything. I might need an intervention. Simply pour the unsweetened cocoa powder and the vodka into your large glass container and seal the lid. Place this in the refrigerator for a minimum of two weeks and up to a month. Shake the bottle well at least once a day. After two weeks you can taste test your chocolate vodka to see if it’s “chocolate-y” enough for you. 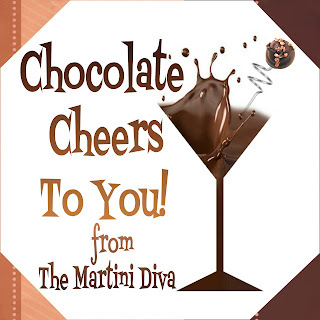 The longer you allow the cocoa to distill in the vodka the stronger, and more mellow, the chocolate taste. Once your chocolate vodka has the right amount of flavor for you, it’s time to filter. To do this, simply place your metal strainer over a bowl or container, slip in the coffee filter and pour in your chocolate vodka and allow this to strain. You’ll do this several times, using new filters each time. It takes from ten minutes to 30 minutes or longer for each filtering step so just pour it in and walk away to do something else. Patience is its own reward here. When your chocolate vodka is completely filtered you’re ready to pour into your decorative bottle and add your label! Heat the sugar, cocoa and water in your saucepan over medium heat until it just starts to boil, stirring constantly. Immediately after the boil starts, reduce your heat to low and stir until all the ingredients are completely dissolved. Remove from the heat and allow this mixture to cool to room temperature. Once cool, pour this cocoa mixture into your glass container, stir in the vodka and add your vanilla bean halves. Seal up and store in the refrigerator for two weeks, shaking the bottle vigorously every day. Remove the vanilla pods. Set your metal strainer over a bowl or container (I like to use containers with a pour spout!) Place one coffee filter in the strainer then pour in the chocolate liqueur. This will strain slowly as it will be thick, so I like to only fill each filter about half way and use a new filter each time. Be patient and slowly the liquid will filter through, it can take up to an hour or more for each filter. 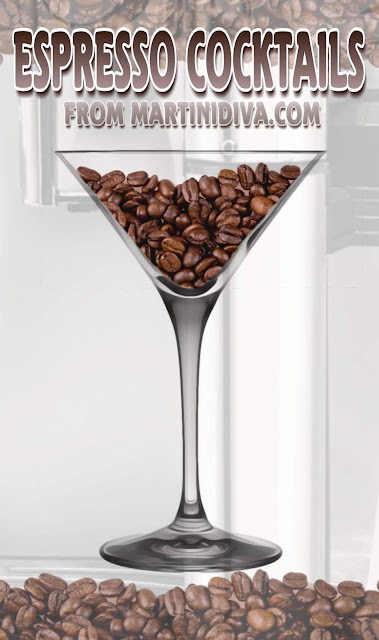 Repeat until you’ve filtered all of your chocolate liqueur, using a new coffee filter each time. Once you’ve filtered all your chocolate liqueur you can pour into your decorative bottle(s) and label. You can enjoy your chocolate liqueur immediately, but if you allow it to age for another month you get a smoother, richer depth of flavor. 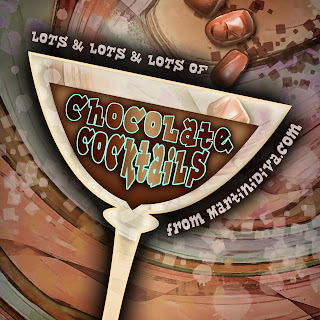 There are two methods for creating a Chocolate Candy Bar Liqueur from your favorite candy bar. One is easy as 1-2-3 and the other involves just a bit of work. I’ve used both methods and find both work depending on what kind of candy bar you’re using! This easy recipe simply involves taking your candy bar(s), chopping them up into small enough pieces, adding them to your vodka and then placing your bottle or container in the freezer** for up to two weeks. (P.S. I cheated and used mine the next day and they were good, but the extra distilling time really mellowed them out!) I find this works very well with plain chocolate or flavored chocolates. If you’re using plain chocolate there is no need to strain your liqueur, you can simply bottle it in a decorative bottle, add a label and it’s ready to enjoy or be given as a gift. I don’t recommend this method for candy bars with caramel, nougat or hard pieces of toffee or similar ingredients; instead I suggest using the heating method below. 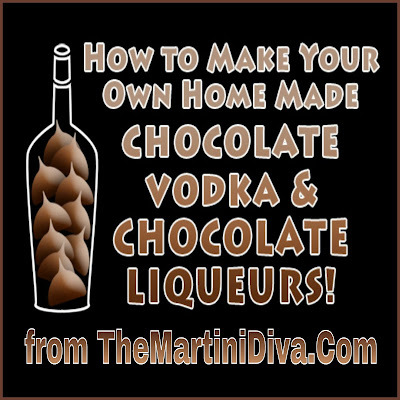 I used this technique to create Chocolate CAKE Liqueur using CAKE vodka for my Chocolate Birthday Cake Martini in place of plain vodka as well! Place your chopped up candy bars into the bowl and bring your water up to a gentle simmer (I use a medium low heat) until they start to melt. You are going to slowly add your vodka and stir constantly to mix and incorporate it into your melting candy bars. BE VERY CAREFUL NOT TO ALLOW ANY OF THE VODKA TO COME IN CONTACT WITH YOUR BURNER OR FLAME! Do not let the vodka mixture boil as this will evaporate your alcohol! 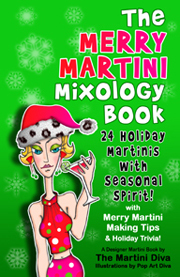 Once all the vodka is added, continue to stir until the mixture is completely blended. Be patient with caramel or nougat as these will melt last. Once blended, set your chocolate liqueur mixture aside to cool. At this point, if your candy bars contain any nuts or fruits or other solids, strain these out using a large metal strainer and strain directly into your glass distilling container. If no solids need to be strained out, simply cap off tightly and place in the freezer** for up to two weeks. Now you’re ready to bottle, label and enjoy or share your newly brewed Chocolate Candy Bar Liqueur! *Refer to the straining methods above. 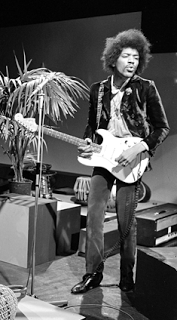 In honor of the great guitarist of the sixties, Jimi Hendrix (November 27, 1942 - September 18, 1970) I'm always experimenting with new liqueurs and brands so I picked up a small mini bottle of 99 Grapes to give it a try. While I would not, in all likely hood, ever drink this liqueur straight, I found the imitation grape flavor very reminiscent of the grape soda I used to love as a kid and this is what inspired this recipe. The sweetness of the liqueurs is cut nicely by the soda and you get an adult version of grape soda! 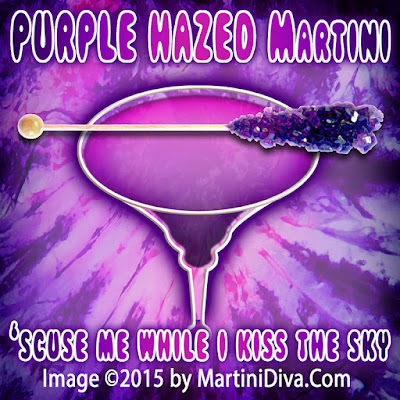 When I mixed it all up and poured it into my martin glass it was the most beautiful purple cocktail I'd ever mixed up and for some reason I thought of Jimi Hendrix's Purple Haze. 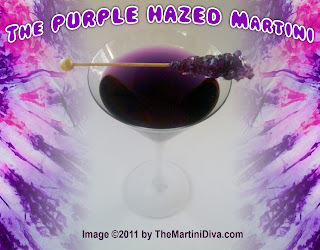 Thus, under the influence of alcoholic grape soda, The Purple Hazed Martini was born. It might be young but, like me and all the rest of us old hippies from the sixties, it's experienced! Add 1 cup of ice to your cocktail shaker then pour in the 99 Grapes and the Chambord. Shake until well chilled. 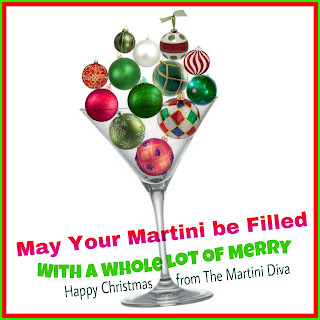 Pour halfway into your cold martini glass. Top with the soda. Garnish with the grape candy stick and serve. This is a truly impressive cocktail to serve to your friends, it delivers the wonderful Crème Brûlée flavors but it's the beautiful caramel garnish that turns this from good to great. 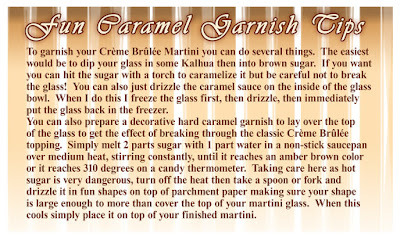 Directions for making the breakable, hard caramel garnish are below. You'll want to practice making the hard caramel garnish a few times - drizzling the caramelized sugar is a bit of a trick. I used a dessert sized spoon in the end and started outside my target area as the first drop is large. When you start moving the spoon the thread thins out - move too fast and the threads get too thin and delicate, too slow and you get big clumps. Practice and pretty soon you'll have a pretty lace like disc. You can always break off nicer areas and drape them inside the glass too! Prepare your hard caramel garnish ahead of time, instructions are just below. Fill a cocktail shaker with ice then pour in the vodka, coffee liqueur and the cream and shake until well chilled. Pour into the chilled glass then place the hard caramel garnish atop the glass for the guest or customer to break into their cocktail. The origins of custards can be traced back to the ancient Romans who were the first to use eggs as binding agents and employed the techniques in creating patinae, crustades and omelettes. The dessert type custards we are familiar with today date back to the Middle Ages where they were most often eaten like a pudding or employed as fillings in pastries or binders in tarts - the word custard is derived from crustade, a tart with a crust. There are many claims to the invention of Crème Brûlée. Trinity College in Cambridge, England claims they invented the dessert in the 1600's where they called it a Cambridge Burnt Cream or Trinity Cream, they even have a special branding iron they use to brand the caramelized topping. 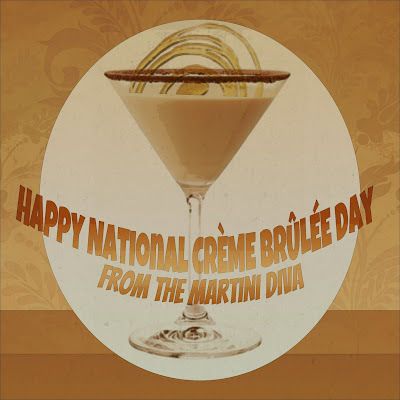 Spain lays claim to a very similar dessert called a Crema Catalana, also from the 1800s, but it was the French in the 19th century brought what they called "burnt cream", literally translated as Crème Brûlée, into the world of modern cuisine. The earliest known print reference to it is in a cookbook by François Massialot's in 1691 but a 1731 edition of Massialot's changed the name of the same recipe from "crème brûlée" to "crème anglaise". Crème Brûlée usually is traditionally served in individual ramekins then topped with prepared discs of caramel or sprinkled with sugar which is then caramelized under a broiler/salamander, a butane torch or by flambéing a hard liquor on it. Putting a Shot of Leprechaun in an Irish Coffee! 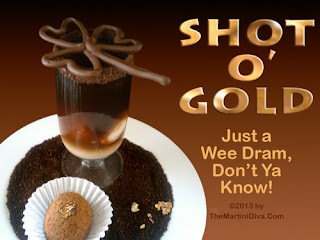 Aye, and it's a lovely little dram of whiskey and espresso poured over magical Leprechaun spheres of golden delicious Irish Cream and milk with a bit o' gold at the end of the cocktail! Melt your dark chocolate in a double boiler or the microwave, transfer to a pastry bag or baggie with the tip of one corner cut off and pipe a few fun shapes. You can pick the best one to set atop your shot glass. Combine the Irish Cream Liqueur and the milk then freeze in small round molds. Brew your espresso and set in the refrigerator to chill. Put some Irish Cream Liqueur into one of the plates and some coffee grounds mixed with cocoa in the other then dip your glass rim in the Irish Cream then into the coffee grounds/cocoa powder to rim. Place your glass in the freezer to chill. Add 1 cup of ice to a cocktail shaker, pour in the whiskey and the espresso and shake until well chilled. Place two of the frozen Irish Cream spheres in the glass. Pour the whiskey/espresso over the spheres. Top off the glass with your chocolate garnish. Set the Shot O' Gold onto a plate filled with the ground coffee, place a few edible gold flakes around and serve. 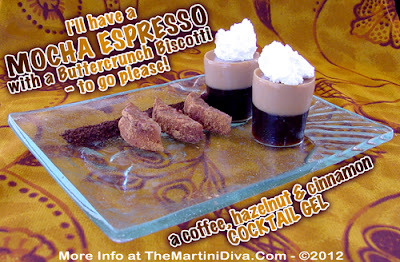 I'll have a MOCHA ESPRESSO with a Buttercrunch Biscotti, to go, please! 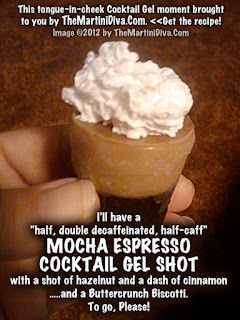 When I decided to make a coffee flavored cocktail gel I kept thinking of how people order their chi-chi coffees at places like Starbucks and that great parody of the whole process in the movie L.A. Story with Steve Martin and Sarah Jessica Parker. 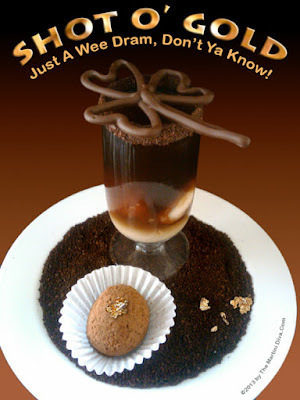 This inspired my whole approach to how I decided to make this Mocha Espresso Edible Cocktail. To tickle the barrista in my soul, I have created a "mocha espresso with a shot of hazelnut. a dash of cinnamon" and it comes with an order of three little gel biscotti on the plate! Measure out all your ingredients and get your tools ready. Pour your non- alcoholic liquid (juice, water, puree, milks, creams, etc.) into your saucepan, stir well and let this sit for a few minutes. Remove the pan from the burner and, if the recipe calls for a package of dessert gelatin, stir it in. Next, quickly stir in your alcohol ingredient. Pour gelatin mixture immediately into whatever mold(s) you plan on using. You can then pour on additional layers, if any. Once all layers are set, you are ready cut, press out with a cookie cutter and/or release the elements of your cocktail gels and plate. I used the small, plastic shot glasses for my molds to get the shape of a cup of coffee from a coffee house. Start with the espresso layer first and do the mocha layer last. Save enough of the mocha gelatin to make your Gel Biscotti. To make the small Gel Biscotti I reserved about 1/3 of a cup of the mocha layer and poured this into the small loaf pan. I tossed in the crushed Butterfingers, let it set then cut out small crescents with my knife. I then rolled the round edge in the cinnamon sugar mixture. If you are molding in a cake pan, dip your knife blade in hot water and slide it around the edge of the cake pan. Do the same when you cut out the separate pieces. Use a flat metal spatula to lift your gel out of the pan. I was making homemade truffles and it occurred to me, "wouldn't these be great stuffed with more booze??" I already had a dash of coffee liqueur in the ganache (which is what you make the center of truffles from) but I thought with a bit more alcohol they could be edible cocktails! 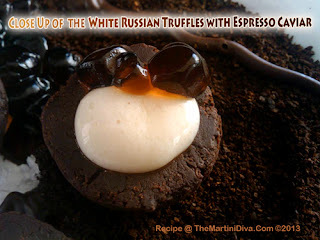 So I pondered on it all night (yes, all night - it kept me awake) and came up with the idea for my White Russian Truffles with Espresso Caviar. You bite into one of these and the Whipped Cream Egg in the center breaks open and oozes cream to mingle with the deep chocolate truffle while the Espresso Caviar bursts on top of it all with an explosion that balances out the sweetness of the rich cream and chocolate. This is like no White Russian you've ever had before! 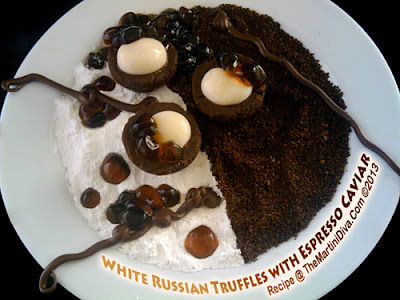 WHITE RUSSIAN TRUFFLES with ESPRESSO CAVIAR RECIPE AND INSTRUCTIONS with recipes & instructions for Mocha Truffle Cups, Whipped Cream Eggs, Espresso Caviar. Melt your chocolate in a double boiler, whisking as it melts, don't allow ANY water into your chocolate or it will seize up. When completely melted, spoon into a small plastic baggie towards one corner. Twist the baggie like you would a pastry bag to get the melted chocolate towards one corner. Snip a tiny hole in the corner and pipe some twigs or other fun shapes onto the waxed paper. Place in the fridge to set up until time to plate. This is the easy part, you simply make a ganache of the ingredients by melting your chocolate in a double boiler, heating the cream until JUST beginning to bubble (Don't Boil! ), Pouring the warm cream over the melted chocolate. Let this sit until the chocolate has started to melt nicely then start gently whisking the chocolate. As you stir, add in the butter pieces one at a time. Then you slowly add in the coffee liqueur, still whisking. Toss in the pinch of salt, mix in then press plastic wrap on the top of the ganache and let it set up in the fridge. You can immediately dip these in cocoa powder or crushed nuts, candies, etcetera for traditional truffles like my Three Liquor Infused Truffle Recipes. For the cups simply mold them into cup shapes or use a candy mold and press an indentation in the center to hold the Whipped Cream Eggs. Pour the canola oil into a tall, thin glass and place in the freezer for 1 hour. Bloom the gelatin powder in the cold water in the custard cup, then stir. Pour this into your warm espresso and mix well, then add the coffee liqueur. Place in the refrigerator until it's cooled off. Pull out the cold canola oil & the cooled espresso gelatin and pipe the gelatin into the icy canola oil in tiny drops - I used a pipette and did 4 quick drops per single caviar sphere. If you use a squirt bottle test a few out to get the proper amount and distance from the oil. You want your caviar spheres to fall to the bottom of the oil and stay out of the way while you pipe others. When you have enough caviar spheres for the number of servings you plan (about 1/4 cup per serving), pour the oil and the spheres through a small strainer into another small bowl to get the spheres out of the oil. You can save the oil for another spherification use. GENTLY rinse the caviar under COLD water for a second or two, then tap the strainer onto some paper towels to drain off the water and store the caviar in the refrigerator until ready to plate. IMPORTANT NOTE: These can melt quickly so try to do them just a short while before you plate your dish and plate them last then immediately serve! Take a look at the photo below - you can see the liquid espresso starting to leak out onto the Whipped Cream Egg portion - These Espresso Caviars just burst in your mouth and you get an explosion of dark espresso laced with a touch of coffee liqueur to complement the deep, dark chocolate Mocha Truffle Cup! 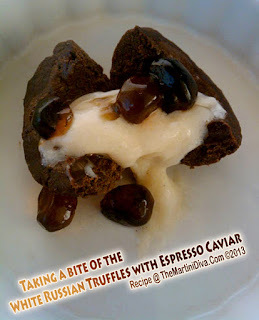 See how the "Whipped Cream Egg" oozes out of the Truffle Cup? It's like Whipped Cream Pudding in a little Egg Shell that breaks open! I used a reverse spherification method on these. Make your Bath first by blending the sodium alginate and the distilled water together until the chemical is completely mixed into water. You will see your mixture is really full of air bubbles and usually you need to let it sit for 12 hours to 24 hours for the bubbles to disperse and the chemicals to completely dissolve. For some reason mine was nearly completely clear in an hour so I went ahead and used it. When your bath is clear, pour it into your shallow baking dish. Blend the condensed milk, vodka, calcium lactate and xanthan gum together. You will have a pretty gummy consistency, much like pudding. Take a small round spoon and spoon dollops about 1/2" or so directly in the bath solution. You want to try to shape them as close to a ball as possible so you may have to do a few to get the hang of it. Don't worry you have enough cream solution to make about 15 little balls or so. Stir each ball around a bit in the solution to help form the ball and allow the bath to create the gel "shell" skin around the creamy center. (You'll want to let the "eggs" sit for a minute in the solution to form the gel shell around the cream.) Once you have enough balls simply scoop them out with a spoon, roll them gently into your hand and GENTLY rinse them off with cold water in your hand allowing the water to siphon through your fingers. You can touch them lightly with a paper towel to get off excess water but it's not necessary. TIP: The longer you let the balls sit in the solution the more of a "skin" will form, more of the shell skin makes a hardier ball but too much makes for an unpleasant mouth feel and hard to burst open. Then place them right into your Truffle Cups and set your truffle cups in the refrigerator while you set up your plating. In the photo at the top you can see I split the plate in two with half coffee grounds and half powdered sugar as my base. I put my Truffle Cups slightly off balance with two in the powdered sugar and one in the coffee. Then I placed my Chocolate Twigs in a nice balanced position and gently spooned on the Espresso Caviar into the cups and around the plate in a nice pattern. A rich, chocolate masterpiece of a booze infused dessert!